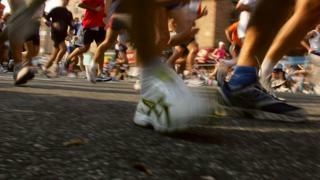 A Venezuelan athlete has died after being hit by a drunk driver while participating in a half-marathon in the Costa Rican capital, San José. Police say the 26-year-old driver was drunk when he drove through a police cordon and hit the Venezuelan runner. The driver has been arrested. The athlete, David Yáñez Pacheco, died moments after being taken to hospital. Race organisers said they had taken all the necessary precautions but "there are things we can't control". In a statement [in Spanish] published on Facebook, they said that 19 police officers had been assigned to regulate traffic and 90 people had been acting as marshals along the route. Witnesses say the driver overtook a queue of waiting cars and drove through a barrier at the police cordon before hitting Mr Yáñez. He fled the scene but was arrested a few hundred metres away. Mr Yáñez, 35, was one of more than 1,300 runners taking part in the 21km race in San José. He had left his homeland because of the economic crisis in Venezuela and was part of a group of Venezuelan athletes competing abroad, a friend said. Mr Yáñez had been staying for the past four months at the home of Costa Rican Paralympian athlete Laurens Molina. Mr Molina said that the runner had told him he was hoping to come at least second so that he could send the $500 (£380) in prize money to his 13-year-old son in Venezuela. "They train twice a day and are anxious to win because they need the money to build a better future for themselves," Mr Molina said of the Venezuelan athletes competing in the race. Mr Molina said he and Venezuelan runner Angelo Olivo had not seen the accident but had got worried that their friend was no longer running alongside them. "At one point Olivo, the other Venezuelan runner said to me: 'Where's David? What happened to him? '," Mr Molina recalled. Mr Olivo went on to win the men's race.